This pocket-size book shares one woman's way of eating, feeding her family, being creative and preparing deliciousness from scratch. It is truly easier than you think. This is a collection of the many, varied and simple things you can make, grow, "put up" or concoct in your kitchen. It covers basics, like soup stock reduction and yogurt. And, Pumpkin Mash, of course, and even a good lotion for your hands. It's not a diet, just a way of life. The author eats organic as much as possible, from protein to fresh vegetables, dairy to dry goods. She has stock in the freezer to enhance rice or sauces. She makes hostess gifts and holiday presents from her own ingredients, with her own hands. In this personal handbook, Ginna tells you how to do it. This book is one of Ginna's contributions toward growing a better world. Just say, "I'll do it myself!" Support your local bookseller. If they do not carry the book, they can order it easily. Print Edition: Compare online prices worldwide. 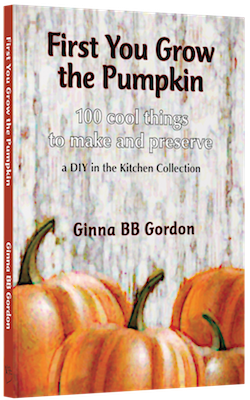 View Ginna Gordon's books on Amazon.